In this article we will study Theory of Demand and Law of Demand. we will discuss about Market Demand, meaning of demand, relation of demand and price and also discuss about factors which affect market demand. In economics,Demand refers to the desire of the people to buy a commodity backed by willingness and ability to purchase at certain price. The relationship of price and demand is inverse, it means if price of the commodity increases demand will decrease and vice-versa. Price – Price of the commodity also affecting market demand because if price increases demand decreases and vice-versa. Consumers Income – There is direct relationship between income and demand.When income of the consumer increases demand of the commodity also increases and vice-versa. Price of related goods – * In case of substitute goods,demand of a commodity increases with increase in price or vice-versa. * In case of complementary goods,demand of a commodity increases when price falls. Taste and Preference – Demand of a commodity also affected by the change in taste and preference of consumer. Income distribution – If income is distributed equally, quantity demanded will increases and vice-versa. Size of population – If the size of population is greater market demand of a commodity is also higher and vice-versa. According to the market demand, this law state that other things remains same or constant, if the price of goods and services increases the demand of a commodity started decline or vice-versa. 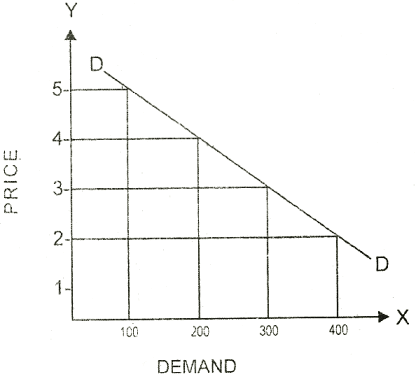 Where, D = Demand of a commodity. F = Function. P = Price. Alfred Marshal says that the amount demanded increase with a fall in price, diminishes with a rise in price. C.E. Ferguson says that according to law of demand, the quantity demanded varies inversely with price. No change in price of related goods. No change in taste and preference of the consumer. The size of population remains the same. This schedule shows , when price of the commodity falls its quantity demanded increases and vice-versa. The Demand curve slopes downward from left to right, it means when price is 5 demand is 100, then price falls down to 4 and its quantity demanded increases from 100 to 200, so demand curve shows inverse relationship between price and demand of a commodity. So we have studied Theory of Demand and Law of Demand. we discussed about Market Demand, meaning of demand, relation of demand and price and also discuss about factors which affect market demand. If you have any query Please let us know in the comments section .